Back in July, we launched the WorldMate for Android “Gold” premium services , and it has become one of the handful of apps to win the coveted “Editors Choice” designation from Android Market! Still, our team has been working overtime on major enhancements to the next iteration of WorldMate for Android—Version 4.0. We’re thrilled to announce its availability as of today! So, what’s new in 4.0? Calendar Synchronization for Outlook, and Google/Android Calendar: Demand for this has been overwhelming—so here it is! Setup takes a minute or two and then all your flights/hotel/car rental reservations in WorldMate will automatically sync to your calendar. 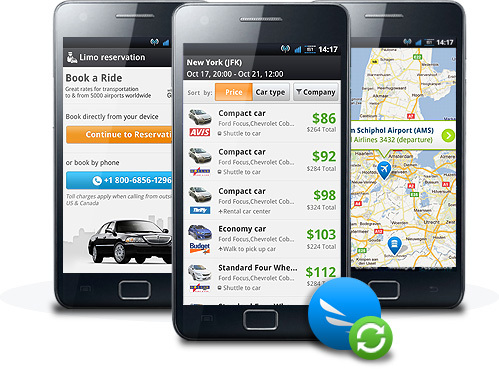 Car Rentals: Renting a car by walking up to the rental counter at the airport is so 2010! With 4.0, you can reserve a car at hundreds of airports around the globe. Select from multiple car rental agencies including, Avis, Budget, Dollar, Thrifty, and many more. Limousine Reservations: Guess what? Limos aren’t just for celebrities or going to the Prom. The next time you’re thinking about that $85 taxi from the airport into New York City, check WorldMate for a much more comfortable town car at comparable prices. With our partner, GroundLink, we’re providing limo reservations to/from airports all over the world. Reservations are made with a simple click to call or, if you just don’t like talking to people much, you can reserve directly within the app. Try it on your next trip and be one of “those people” who have a driver waiting for them at baggage claim. Improved Graphics: We’ve redesigned the main screen to accommodate the ever-growing number of services with in the app. You will also notice the enhanced mapping functionality- WorldMate now displays a uniquely labeled pinpoint for the airport, hotel, and meetings in your itinerary. Advertisements: My father always told me, “There’s no such thing as a free lunch.” WorldMate is closing in on 9 million registered users, many of whom are free users. Until now, we’ve been ad-free, only serving promotions for our hotel booking service or to our travel insurance/limousine booking partners, etc. With 4.0, we’re introducing 3rd party banner advertising to generate a little cash to pay for everything the millions of free users enjoy today (and to keep our investors and accountants happy!). We hope that its not too intrusive and that maybe you’ll even click one or two of them. Of course, if you upgrade to the Gold version, those ads will magically disappear.